Tomato season is like Christmas in July. There's nothing like the crisp, earthy-sweet flavor of a vine ripe tomato. 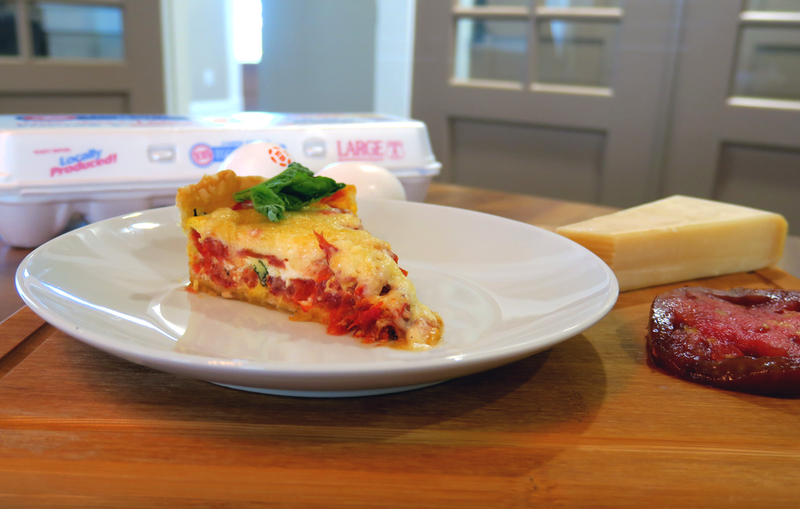 If it's possible to enhance the already delicious flavor of these summertime jewels, our tomato pie quiche is the one to do it. We took Vivian Howard's Southern Tomato Pie recipe and made a few adjustments, the main one being that we added eggs because, you know, #WeAreEggs. 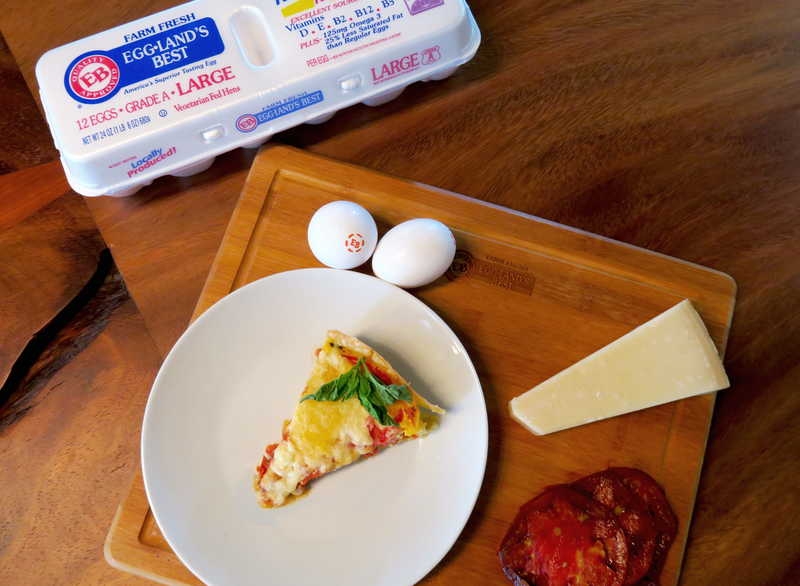 By using just four eggs, the texture of the egg became almost that of ricotta cheese. We found that by turning the pie into a quiche, it balanced out the acid of the tomatoes and gave it a little protein boost, without having a noticeable egg taste. If you like a fluffier quiche, we recommend upping the number of eggs used to 5 and adding 1/3 cup of whole milk. We have to admit that we took a shortcut on the crust by using store-bought crust, because we wanted to eat dinner before 9pm. If you're ambitious, try Vivian's crust recipe. We're sure it's worth it if you have the time. Tomato pie quiche is a bit of a rarity, if you've never had it, think of it like breakfast pizza's much more enticing cousin. Cook time: 1 hour 20 min. Dice the cored and seeded tomatoes into 1/2 in. pieces (follow this tutorial for coring for best results). Toss half of the diced tomatoes with 1⁄2 teaspoon salt and 1⁄2 teaspoon sugar. Set them over a colander to drain for at least 30 minutes. Preheat your oven to 375°. In a medium skillet, melt the butter, add the onion and 1⁄2 teaspoon salt. Cook over medium-low heat until caramelized, about 30 minutes. Meanwhile, toss the remaining diced tomatoes with 1⁄2 teaspoon salt, thyme, and olive oil. Spread in a single layer on a sheet tray, giving them as much room as much as possible. Slide the tray onto the middle rack of your oven and roast for 20-30 minutes. Place your pre-made crust in a lightly buttered 10 in pie pan and place on the top rack of the oven for the duration of time it takes to roast the tomatoes, but no longer than 25 minutes. Once the above steps are complete, stir together the onion, the fresh and roasted diced tomatoes, the remaining salt, sugar, black pepper, and basil and set aside. In a separate, smaller bowl, stir together the mayonnaise, Gruyere, and Parmigiano and spoon the mixture onto parchment or wax paper into a flat layer so that it is the circumference of your pie crust. Do not worry if it doesn't spread to the entire width, as the melted cheese will spread. Spoon the tomato filling into your slightly baked pie crust. If adding milk for the fluffier option, mix it with the beaten eggs and pour it over the tomato filling. If not adding milk, continue with adding the beaten eggs over the tomatoes. Layer the thinly sliced heirloom tomatoes over the egg and tomato filling, leaving your most beautiful 4-5 slices for the top. Next, place the layer of cheese mixture and top with remaining tomato slices and a sprinkle of Gruyere cheese to taste. Bake in the middle of your oven for 30 minutes. Top with fresh basil and enjoy!